This was actually done on a wooden plaque that you can get at your local craft store for about $1.50. You could do this on a card stock sheet of paper for a great Mother’s Day card as well. Use watercolors (on paper) and acrylic (on wooden plaque) and brush back and forth in long strokes going off the sides with each stroke. Use a variation of your Mother’s favorite colors. When done use water based poster paint (used the color white here) and make an impression of hand and feet then finish it off with an ‘L’ and an ‘E’. Something more than just a store bought card that Mom or a Grandma would love to cherish for years to come. I think the same design with blue’s in the background would also work for a card for Father’s Day – I know I would be happy to receive it. 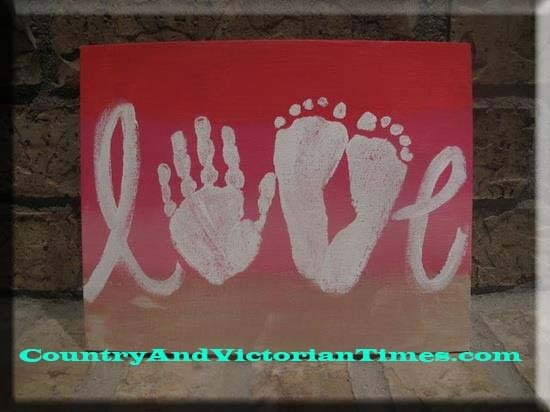 This entry was posted in Crafts ~ DIY ~ Projects, ~Childrens Activities, ~Father's Day, ~Mother's Day and tagged acrylic, card, craft, father's day, gift, Grandma, holiday, mother's, mother's day, mothers day, paint, paper, parenting, plaque, poster, stock, watercolor, wood, ~Art, ~Home. Bookmark the permalink. Could I please use your picture in a post? I will link back to you. I’m doing a post on my favorite Mother’s Day hand and footprint crafts. Thanks for your consideration. Thank you so much – best wishes blogging!